MAY 18-20, 2018 | HAPPY WINE FEST WEEKEND! Celebrate the wines of Paso Robles at our picturesque tasting room. We’ll be releasing our 2017 Rosé and offering case specials all weekend. Saturday, May 19: WOOD-FIRED PIZZA. Farmstead Catering will be onsite serving up piping hot pizza from their wood-burning oven. Treat yourself to a fun day of wine and pizza on our charming back patio. Serving from 12pm to 4pm. COMPLIMENTARY for our guests! Spring releases are here! This May you’ll receive our 2015 reds as well as whites from the ’15 and ’16 vintages. The 2015 vintage came at the peak of the historic California drought which yielded beautiful wines with intense flavors! May 9th – customization deadline. May 10th – cards on file will be charged for active members. May 18th - pickup orders ready in the tasting room. May 21st – shipments go out to those who are not picking up. 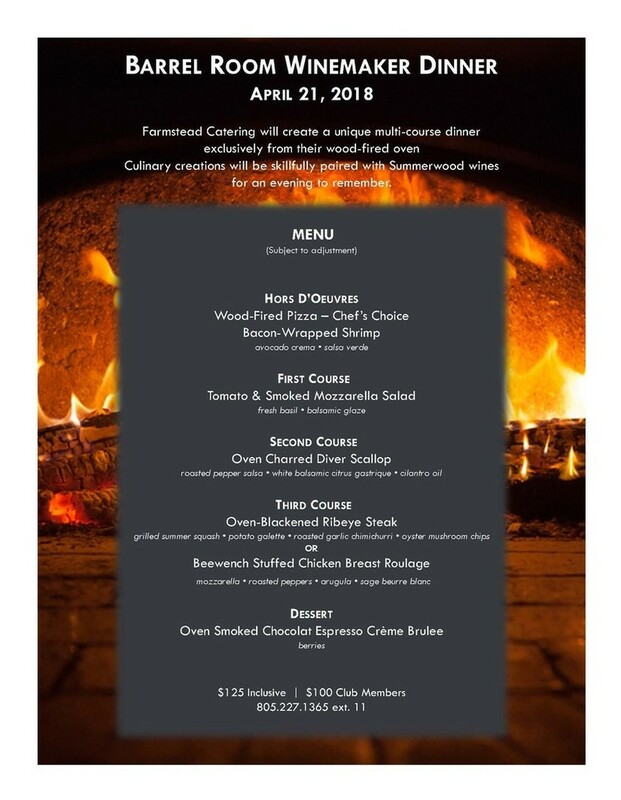 Farmstead Catering will create a unique multi-course dinner exclusively from their wood-fired oven. 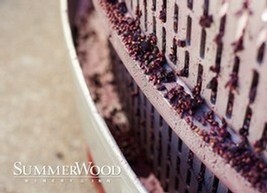 Culinary creations will be skillfully paired with Summerwood wines for an evening to remember! Call the tasting room to put your name on the list, 805.227.1365 ext. 11 or purchase tickets online by heading to our events page. We're welcoming 2015 at SummerWood Winery & Inn with new wine releases and some healthy recipes! Drop by the tasting room and check out the 2013 Viognier, 2011 Syrah and 2011 Reserve Cabernet Sauvignon. The Viognier, a blend of fruit from both Alta Colina and Hearthstone Vineyards, features aromas of white peach, honeysuckle, orange blossom and apricot pie. The wine is enticing, with flavors of creamy, ripe peaches and apricots intertwined with citrus and honey. The acidity is immense, with a long, persistent finish. The 2011 Syrah is a treasure box of aromas -- ripe plum, black cherry, licorice, tobacco leaves, chocolate, vanilla and leather, leading to complex, full flavors of black cherries and plum with a touch of dark chocolate and butterscotch. The Reserve Cab hails from the Stanger vineyard; its dark, inky red color hints at the intensity of this vintage -- berry and cherry aromas invite notes of dark chocolate, pencil shavings and cassis with a hints of vanilla, cola and sweet, toasted oak. The flavors echo the aromas with a touch of roasted coffee beans. This wine is a favorite of Winemaker Mauricio Marchant, who suggests enjoying some now and holding back a few bottles for your future enjoyment! 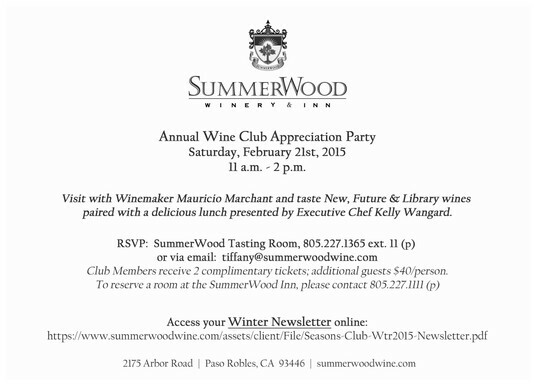 We hope to see all of our valued wine club members at the Annual Member Appreciation Party on February 21, 2015 (11am-2pm). Be sure to RSVP to 805.227.1365 ext. 11 or via email. Kelly and Mauricio have a fabulous menu/pairing prepared for the celebration! Best wishes for a wonderful 2015 -- cheers! CONGRATULATIONS TO CHEF KELLY FOR WINNING last night's Cutthroat Kitchen!!! The lively episode, titled “The Undertater”, included challenges in which she prepared a stuffed baked potato and cooked Korean short ribs. The final challenge found Chef Kelly sabotaged, playing a memory game to retrieve needed ingredients to prepare her award-winning blueberry turnover, all while handcuffed. 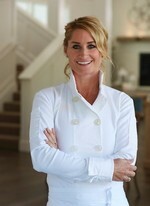 Throughout the competition, Chef Kelly was sabotaged five times, with final winnings totaling $6,900.00. Cheers!! A reality cooking show hosted by celebrity chef, author and television personality Alton Brown, Cutthroat Kitchen features four chefs faced with three cooking challenges. At the beginning of the challenge each chef is given $25,000, which can be used to sabotage their opponents and/or used to bid on ingredients for the competition. Each challenge gives the chefs a dish to create, with 1 minute to retrieve their ingredients from the pantry. The contestants are then given 30 minutes to prepare their dish. Upon completion, a guest judge evaluates each dish and the chef with the worst dish is eliminated. Episodes broadcast so far this season include, "Crabs of Steel", "SaBOOOtage" and "Chip Off the Ol' Baklava". SummerWood Executive Chef and Inn Manager Kelly Wangard, learned of the opportunity after receiving a Facebook message from the show's casting director, who was searching for a female executive chef. A quick telephone conversation and Skype interview followed, with Wangard learning she had been selected within a week of the initial contact. To prepare for the show, Chef Kelly practiced perfecting simple dishes in a short amount of time, and also brushed up on her baking skills. The episode was filmed in mid-May in Burbank, CA. Without divulging too much information, Chef Kelly commented that, "it was by far the most challenging, stressful and hilarious cooking experience I've ever had! The show has a ton of staff and it seemed to be a well-oiled machine. I was very impressed with the professionalism and how they were able to produce 5-6 shows a week." Check it out this Sunday & raise a glass of SummerWood wine to cheer Chef Kelly on as she competes in Cutthroat Kitchen!